Home / Afghanistan / Geo Politics / India / Iran / Opinion / Pakistan / The Middle East / What Does Iran’s Changing Foreign Policy Mean for India? As India expands its strategic and economic ties with the Gulf Cooperation Council (GCC) and with Israel, New Delhi is also seeking to strengthen its ties with Tehran. The Iranian Nuclear Deal, formally known as the Joint Comprehensive Plan of Action (JPCOA), signed by Iran and six global powers in 2015, created new opportunities for New Delhi in Iran, especially since Iran is India’s potential gateway to Afghanistan and Central Asia. India’s main goal has been to secure access to Afghanistan and Central Asia. Pakistan has continuously opposed India’s entry into the Afghanistan-Pakistan Transit Trade Agreement (APTTA), even though Afghanistan has been in favor of India joining it. Currently, Afghan goods can enter India, but trucks stop at Wagah (on the Pakistani side of the border). India, however, has been deprived of land access to Afghanistan and Central Asia. There have been some impediments to the Chabahar project actually getting underway by 2018. The companies which are to develop customized equipment jetties and container terminals were not willing to take part in the bidding process. Their banks were not ready to facilitate financial transactions involving Iran due to the uncertain policies of U.S. President Donald Trump’s administration toward the Islamic Republic. Furthermore, there was a delay in loan disbursement of USD 150 million, and India and Iran blamed one another for the setback. Transport Minister Nitin Gadkari, who attended Iranian President Rouhani’s swearing in on August 5, 2017, declared: “India and Iran have been historically sharing special ties ... We are keen on developing Chabahar Port and are hopeful of starting operations in 12 to 18 months." India will be closely observing Trump’s warnings to Iran regarding the nuclear deal. Iran has categorically stated that it will quit the JCPOA if more sanctions are imposed. Rouhani recently warned, "Iran could quit the nuclear deal within hours if the U.S. imposes more sanctions." Even though Iran has adhered to the stipulations of the deal, Trump has threatened to quit the accord and impose sanctions, while America’s top diplomat, Rex Tillerson, has made it clear, on numerous occasions, that Washington will not scrap the deal. The U.S. Secretary of State favors engaging the Iranians in order to promote stability in the greater Middle East - especially in Iraq and Syria, where Islamic State is losing ground - by holding the regime in Tehran accountable. Given India’s increasingly close ties with the U.S., and the importance of Iran in the context of connectivity with Afghanistan and Central Asia, the unpredictability of Trump’s foreign policy may well pose a major challenge to India, as officials in New Delhi seek to strike a balance between good relations with Washington and closer ties with Tehran. Iran already has strong economic ties with China, and moving closer to Pakistan would not serve its purposes. New Delhi has been trying to work jointly with both Afghanistan and Iran, much to the chagrin of the Pakistan army. New Delhi will also be keeping an eye on Iran’s moves vis-à-vis Saudi Arabia and Turkey. On the sidelines of the Organization of Islamic Cooperation (OIC) meeting in Istanbul in August 2017, the foreign ministers of Iran and Saudi Arabia met and exchanged greetings. Last month, Iranian chief-of-staff of the armed forces, Major-General Mohammad Baqeri, visited Turkey to explore possible synergies in counter-terrorism and the Syrian conflict. This meeting clearly indicates a significant improvement in Tehran-Ankara relations. Although there is less reason for optimism regarding overtures between Iran and Saudi Arabia, the exchange at the OIC was notable and will perhaps pave the way for dialogue and restoration of diplomatic relations between Tehran and Riyadh. New Delhi has strong ties with both Iran and Saudi Arabia, yet maintaining this geopolitical balance in the Persian Gulf will continue to prove challenging for India. India has also managed to benefit from the two countries’ rivalry by playing Tehran and Riyadh off each other. Given India’s growing importance to Iran and to the GCC countries, New Delhi could perhaps pressure all Persian Gulf states into urging Pakistan to take action against certain terrorist organizations. Saudi Arabia has been apprehensive about India aligning too closely with Iran, and this has resulted in Riyadh not only adopting a more nuanced stance on terrorism emanating from Pakistan and in extraditing terrorists but also strengthening security cooperation with India. To be sure, India is bogged down with numerous domestic challenges and other foreign policy dilemmas, chiefly China, and Iran are not necessarily a central focus for New Delhi’s foreign policy decision makers. 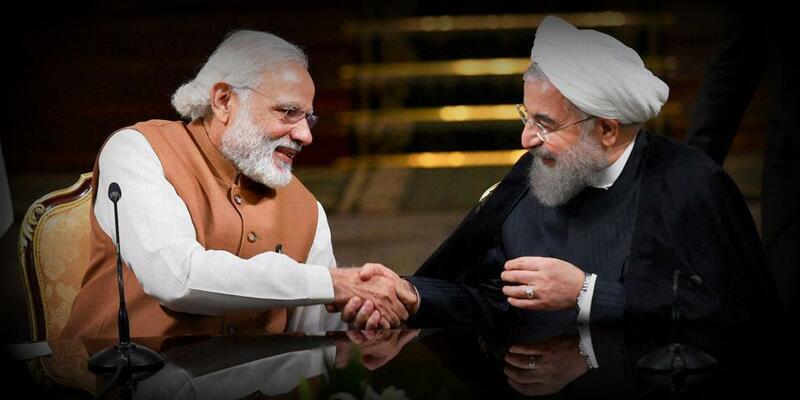 Yet Iran’s next moves vis-à-vis the Trump administration, the Arabian sheikdoms of the Persian Gulf, as well as Pakistan, will heavily impact India’s position within the geopolitical landscape across greater Asia. Tridivesh Singh Maini (@tridiveshsingh) is a New Delhi-based Policy Analyst associated with The Jindal School of International Affairs, OP Jindal Global University, Sonipat, India. Sandeep Sachdeva is an independent policy analyst and a graduate of The Jindal School of International Affairs, Sonipat.